A few weeks ago we had a visitor at the Googleplex: Rob Hof, the Silicon Valley bureau chief at BusinessWeek. Rob talked to a bunch of Googlers and sat in on one of our weekly quality-leads meetings. The resulting story is out now. The first part of the story covers some of the challenges facing Google, but the second part gets into more detail than we normally get into. Q: I think the criticism is: Where’s the money in those [non-search/ads parts of Google]? A: The right way to look at it is not the money. Is there value to the users? If you bring value to the users, I think we will succeed in the long run. Some things make more money than others, but as long as we keep bringing value to the world, we will be successful. But the other thing we always do is we go in and look in more detail at what are some of the individual positive and negative things that we’re getting out of this. Are the positive things really that positive, will they really make a difference to our users? And maybe more important, for the negative things, how important are they, can we live with them? At the entrance to Google’s main cafe, there’s three doors. Two are normal doors that you pull to open, and they always work. The other door is a spiffy automatic door that slides open for you–except that the automatic door seems to be broken about 5-10% of the time. When the automatic door works, it’s very cool and you’d definitely prefer to use it. But when the door is broken, you’re left standing in front of a glass door and you feel like a dork as you wave your hands, move around, and generally try to get the “automatic” door to open for you. I’ve noticed that many people stopped using the sometimes-broken automatic door and instead always go straight to the reliable doors. Search can be kind of like that door in a lot of ways. Spiffy features are great, but if they’re wrong or don’t trigger in some reasonable way that your mind can predict, the failure is worse somehow. The same holds true with the organic search results: a catastrophic search failure can stick in your mind much more than the 200 searches that worked well. Search quality evaluation is tricky because you need to take that factor plus hundreds more into account. It’s taken years for Google to really evaluate our quality well, and we still continue to learn important new things. If you really want to understand more about how Google thinks, I highly recommend Amit’s and Scott’s interviews. They’re a great reminder to me that we have a very deep bench of smart, well-spoken people in the search quality group and in Google in general. I would love to see more Googlers talking about their work. And finally, on the subject of Googlers talking about their work, a whole bunch of Googlers will be at the Search Marketing Expo East in New York this week. Joachim Kupke will talk about duplicate content, Ari Bezman will talk about maps, Jack Menzel will talk about what’s next in search and universal search, Jeremy Hylton will talk about real-time search, Maile Ohye will talk about best practices for search, Matthew Liu will talk about YouTube, and Frederick Vallaeys will answer questions about AdWords. Also, don’t miss Bruce Johnson and Kathrin Probst from Google. They’ll be on the “CSS, AJAX, Web 2.0 & SEO” panel. If you’re at SMX East, I think you’ll enjoy that panel. Anyway, I really like your analogy of the super-cool, sometimes-working automatic door with spotty search features. People tend to stick to the tried and true methods, which is perfectly expressed through the avoidance of the door that has burned them at least once… the classical conditioning of search. Brilliant! I have one of Udi’s book on algorithms. I quite like it. Search quality is quite difficult. Sometimes, for really “hot” topics, you guys will return a bunch of really low value sites, or outright spam blogs, right on the first page. Annoying, but I often find a lot of really good stuff on the second and following pages. I’ve noticed that bad results do get caught fairly quickly though, so no worries. It’s an arms race. Hey Matt – that’s a pretty strong line up of Googlers for SMX East. Frederick Vallaeys will answer questions about AdWords. Is Google’s attendance schedule for conferences published anywhere in advance? It would be great to know where Google plans to participate, so that we can plan to participate. Or is it a business relationship with the SMX show planners? I find that the rage and pain felt during the failure of a computer system is inversely proportional to how much I understand about the fault and how much utility the system provides. I’ve avoided the door at Charlie’s since the first fault because it doesn’t provide much advantage over the ones next to it and I know how easy it is to open reliably. Search failures are less scaring for me because I don’t really know much about how things go wrong and because Search blows my mind on a regular basis when I expect it to be more difficult to find my result. I read the businessweek link, this gives a good insight into the problems faced by search engines, as I assume they would all have similar problems to deal with. Not least of which might be how to define quality with something so subjective as search engine results on the internet, where websites come and go, change content etc on a large global scale, not to mention language and cultural differences and the increasing sophistication of spammers and hackers. For many people (well those that take the time to read it) the article might give people a better understanding of the problems faced by search engines, and in relative terms, Google has more to deal with. So Bing/Yahoo etc might seem less like competition and more like welcome neighbours on Googles lonely hill top. I often select the model of whatever it is I’m buying that has less bells and whistles. Sooner or later some of the bells and whistles are going to break. I’m kept awake at night thinking about the catastrophic Google searches I’ve done. This seems like it’s a much bigger deal at the Googleplex than it is for actual users. We just tweak our search and try again. 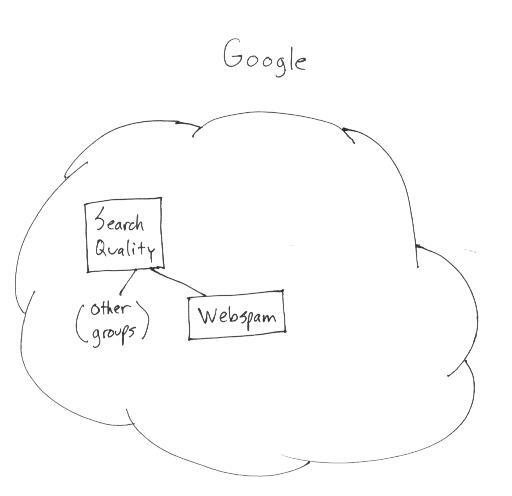 One of the biggest challenges facing Google is “Relevance” or “Search Quality”. On the first page of Google’s results for the phrase “Custom Sweatshirts” is a page (today it is # 6 and is creeping upward) that is totally irrelevant to the query. 1000 auto-generated text-links (all from the same site), is enough to rank # 6 for a search phrase that is totally irrelevant to the query and goes for $1.93 – $2.55 per click. Or the first 2 organic results for “Custom Golf Shirts” is the same site with two different URLs, and if you look at the in-bound link profile, you will find dozens of the same duplicate sites all with different names, all linking to each other. I should have been more clear, because the site that I was refering to that was the was #6 for “Custom Sweatshirts” has changed its position. It is about fleece blankets. Nowhere in that document is the word “Sweatshirts” mentioned, only in links pointing to that page. Your post today is a good argument (for me personally) that links don’t count correctly always. I read an article about the feature in business week first at businessinsider.com – and then I remembered your Blog and thought that you’d have a post about this article too and typed into my browser http://www.mattcutts.com – and …. surprise …. you wrote about this stuff too. No links to count, no pagerank to pass, only “knowledge” stored in a brain: if it’s relevant to search (quality) it’s at Matt’s Blog. It’s the same “method” we use if something in Entertainment happens, you type in TMZ, TheInsider, Daily Beast (and in Germany Bild.de) and you KNOW in advance that all relevant topics are covered there. Of course this could be a signal to analyze too – but a very tricky one, there is a lot of noise attached to that and so far as I know you can’t look into (trained) brains. I like the conclusion that work makes at least some Googlers happy because it is not a “project” but a never ending process, that it always could be improved, that it is a really big job to do. More than a job – it’s an attitude towards life. Matt, I’m can make nosense of that question. Surely the ONLY answer is, the money comes about when users click the ads? What is meant by “backlinks to this URL”? I thought I didn’t need to worry if spammy websites were linking to me? Could you maybe address this in a Google Webmaster Central Channel video? I’ve been following all your posts on twitter, and I definitely enjoyed reading those interviews, though I kind of wish they were video interviews…reading is just so boring Your post today is a good argument. web sites that are helpful to people, and their searches, but also not give top relevancy to scammers over hard working companies. I have a Question….. I have noticed that when I do a Google search on my machine at home that the results tend to be fairly relevant to me. When doing the same search on my Mother’s machine this is not the case, which I am assuming is because her “Cookie” and search history are different than mine. The search results seem to be more relevant to her, which I also assume is the goal, Tailored Search results. If this indeed the case, is this type of search algorithm used across the board? I ask this because I noticed a disturbing trend. When I search on political issues most if not all of the results are of the Left leaning type which I admit are relevant to me. Doing the same search on my mothers machine the results are mostly of the far right bent and are relevant to her. These types of results while great for durable goods and services seem detrimental to the public in search of balanced discourse. My mother ( “Who is not at all computer literate” ) thinks that the search results are the totality of what’s on the Net and I am sure that there are a great many people just like her. There seems to be some sort of positive reinforcement loop thing going on where ” I’ll only tell you, what you want to hear. “. When so many people today use Google as their primary way to gather News I just wonder if the ” I’ll only tell you, what you want to hear. ” type of results is “aiding and abetting” the divisions in our country. I also wonder about the unintended consequences of this sort of “BUILT-IN” Media Bias? As to where is the money, Google is not unlike most standard business models. Lifetime value. What is the value of a customer based on what she spends over time. click on Googles goldmine ppc ads. Give them a free razor and sell the blades attitude at Google seems to be working great. Think they posted some huge profits today. 2) chinese website spamming – it seems that most of the ecommerce searches nowadays turn up chinese websites (pretending to be legit and selling counterfeit goods) that when you check their backlinks it is all spam on other chinese sites – why can’t you devalue links from non-english sites when a search is done in english from an english region? 2- You will see the “edit” on the right hand side has added a Seatwave link. 5- Very obvious but seatwave is trying to alter the search results. Is this the sort of webspam Google looks after? google fails to understand the value of realtime search, limiting it to your “extended circle” does not provide the real time search we need! when my favorite site goes down its all over twitter when i need to know what happening right now, its on twitter, not just the people in my “extended circle” . You can sort your results however you want but removing them if they are not in my extended circle? Um r u guys serious? Tweetrank it man don’t omit it!